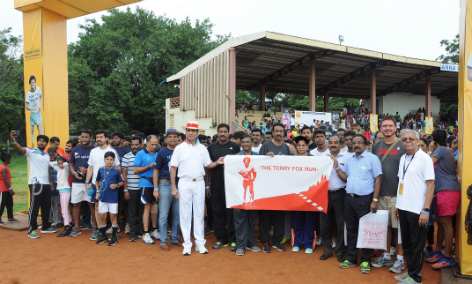 Chennai: The 9th Terry Fox Run for Cancer Research was held at Anna University on Sunday and saw over 5,000 participants from all age groups. The Rotary Club of Madras East is organising this run for cancer research since 2009. Celebrities, well-wishers, students from schools & colleges, employees from corporate houses, banks and private companies interested in cancer awareness part of the cause and effect. Rtn. Srinivasan, Dist. Governor – RI Dist. 3232, Lieutenant General Mr. R. K. Anand, GOC, Dakshin Bharath Area, Rtn. BS Purushotham, President, RCME, Dr. Chelladurai, Additional Registrar, Anna University, Dr. K. Srinivasan, Dean, A.C.Tech., Anna University and other Rotarians were present. “The run was brought to Chennai in 2009 by Akash Dube, a cancer patient, with the help of the Rotary Club of Madras East & IIT Madras. He had participated in the Terry Fox Run in Dubai and was motivated to bring the same to Chennai. The last 8 runs have been an amazing success with more than 70,000 supporters participating, with celebrities like Vikram, Anu Haasan, Radhika and Sarath Kumar giving their support. The GOC TN, Karnataka, Kerala area, The Officers’ Training Academy and Dr. Badrinath of Sankara Nethralaya have been torch bearers. It is very poignant to say that the Terry Fox Run in Chennai will take place without its champion, Akash Dube. He battled cancer with zest and courage, but succumbed to it in 2012. We have taken up the baton to continue his legacy – The Run; and ensure that his spirit lives on! The event is a fun filled family run supporting a social cause, well attended by all age group. It is important to note that no corporate sponsorships are accepted. All donations are voluntary and participants in the run are the sole supporters,” he further added. Over INR 1,30,00,000 (One Crore and Thirty Lakh rupees) has been donated by numerous large and small contributors towards cancer research through RCME. The funds raised last year (2016) were used for the cancer research projects of Vision Research Foundation (Division of Sankara Nethralya) and Adyar Cancer Institute.